Posted on March 20, 2017 March 20, 2017 by Aquanetta J. Betts, J.D. What comes to mind when you hear the word Spring? The answers are many: flowers, rain showers, cleaning rituals and a vibrant energy all around. Let’s take a close look at the ‘vibrant energy all around’ us. People are buzzing about with a new sense of being because the cold days of winter are mostly behind us. Flowers and greenery are sprouting up everywhere with colors and scents that wake up our sleeping senses. The seasons have changed and in doing so, the wonders of nature are upon us again. That’s why your estate plan should change with the seasons in your life. Contact your human resources department, financial institutions and insurance companies: ask for copies of your beneficiary forms. Make sure beneficiary designations are up to date and reflect your wishes (life insurance, Retirement accounts, bank accounts, etc.). Change beneficiary designations if you have had changes in your life (family members): marriage, birth, retirement, divorce, new assets, death or other events. 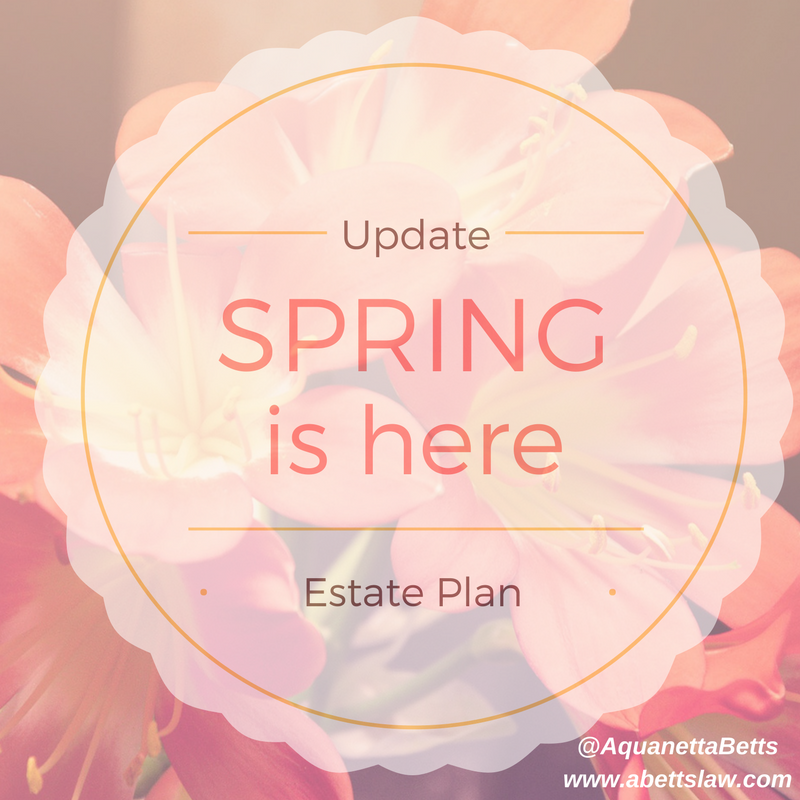 There are many parts to an estate plan. Wills, trusts, powers of attorney and advance directives are other items that need to be refreshed from time to time as well. Aquanetta J. Betts is an attorney licensed in the District of Columbia and Maryland. Connect with her on Twitter @AquanettaBetts. This article is for informational purposes only and not intended to provide legal advice.